The VPD1 vintage pre-drive pedal is a lot more than just an overdrive. With the additional boost section, top and mid boost, remote control, and a vintage-type speaker simulation, VPD1 is a genuinely versatile guitar pedal. Good condition. Sale of used pedals only in our retail store (Jakobsoni 14)! The ODB-3 Bass OverDrive delivers the chest-resonating distortion that hard rock, thrash, and punk bassists have been waiting for. 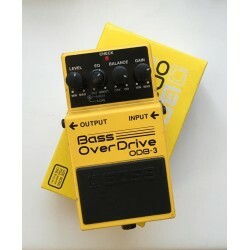 This hot compact pedal has been designed specifically for bass applications. Good condition, original box, without power supply. Sale of used pedals only in our retail store (Jakobsoni 14). Wide range sampling rate/depth reducing effects, 3 modes for using guitar, bass, synth or sound player, Sampling Rate Range: 31250Hz~60Hz, Sampling Depth Range: 16Bit~5Bit, Full metal shell, Very small and exquisite, True bypass. Sale of this pedal only in our retail store!